This bait contains Brodifacoum, the strongest anticoagulant available for the toughest rat and mouse problems. 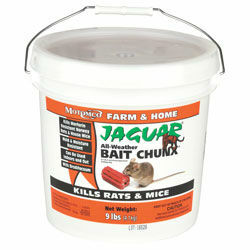 Jaguar® Bait Chunx kills in a single feeding and is an all-weather rat poison that has multiple gnawing edges and a hole in the center for placing on bait station securing rods. Provides effective results in 4 to 6 days and requires less bait to be effective.